QCOM leads in the newest standards. By next year, LTE Advanced Pro will be widespread. By 2019, 5G could begin. Cutting QCOM will compromise iPhone performance. 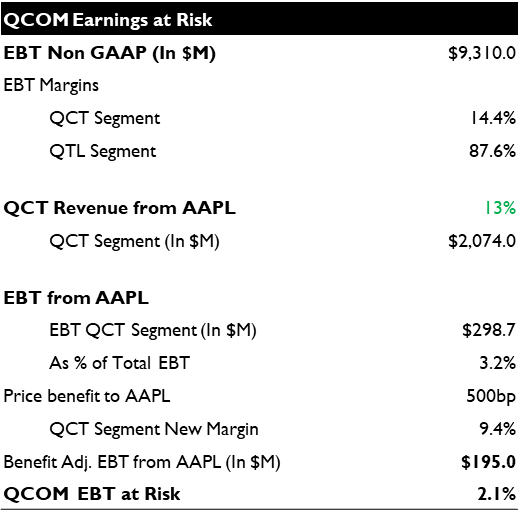 The market reaction to this negotiating gambit (QCOM -7.3%) is overdone given the incremental threat. We believe that the dispute will eventually be settled to QCOM’s favor. The WSJ is reporting that Apple is evaluating alternatives to Qualcomm modem chips for its iPhones and iPads to be delivered for the next model season. Apple is already using Intel modems for at least half of its iPhones, and could increase that to as much as 70% in 2018. The Intel part does not yet integrate support for either the CDMA variant of 2G/3G networks, leaving Apple dependent on QCOM for products destined for AT&T, Sprint, Korea and some of the Chinese market, but everyone else could get Intel Inside this year. The WSJ report suggests that Apple is comfortable that Intel (and potentially MediaTek) could meet their needs for all of its modems for its FY2019 and cut nettlesome Qualcomm out of the picture entirely. Of course, Apple has no need to rush. It will be able to change its decision on the iPhone X-S (or XI, or 11, or whatever they decide to call it) as late as June of next year, so the timing of this exclusive leak to the WSJ has a whiff of malicious intent to it. As we all know, Apple is amidst an acrimonious dispute with Qualcomm over royalty rates for the latter company’s patents, and, with Qualcomm shares down 7% on the rumor, the press is a mighty weapon. A lower share price makes it harder for the chip and IPR supplier to retain valuable employees and brings pressure from shareholders to resolve the problem sooner rather than later. However, taking the story at face value, cutting Qualcomm does carry a cost to Apple. Already, its newest models do not support the latest 4G standard, LTE Advanced Pro, which could take user downlink speeds to 1 Gbps, even before 5G (Exhibit 1). This is not a big problem today, as relatively few carriers have added the newest spec and then only in a few markets, but could be a bigger performance drawback by this time next year. (N.B. for the few Qualcomm modems that Apple is still buying, it is disabling LTE Advanced Pro capabilities). Looming ahead is 5G. The first 5G handsets will likely hit the market at the end of 2019, and almost certainly, Qualcomm will be first and best with modems to meet the standard. Apple may have to face sitting out the first year or two of the new standard until its preferred chip vendors catch up to the party. There are decent odds that Apple would shuttle down to San Diego, hat in hand, to ask for some Qualcomm modem samples. On the Qualcomm side, the loss of the rest of Apple’s modem business would be less painful than the market seems to suppose. The WSJ estimates that Apple will spend $2.1B on Qualcomm chips for the whole of 2017, and we believe that the number will be even lower in 2018. $2.1B is about 13% of Qualcomm’s total chip sales, and about 8% of total revenues (if Apple and its partners were paying the royalties due). However, EBT margins on Qualcomm’s chip sales are 14.4%, robust for a chip business but tiny compared to the 86.7% margins it earns on its royalty business. If the modem sales to Apple were at normal margins, the lost revenues would correspond to $298M in EBT, or ~3% of total. Taking it further, given the tough negotiations between the two companies, the volumes involved, the relative simplicity of the part (most of Qualcomm’s chip sales are integrated System-on-a-Chip solutions rather than stand-alone modems) and Apple’s commitment to dual sourcing, it would seem likely the EBT margins on this revenue are considerably lower than average. If so, the Apple modem business at risk might be worth less than 2% of Qualcomm EBT (Exhibit 2). We think this is yet another salvo in a multifront war aimed at forcing Qualcomm to soften its demands on for IPR royalties. Of course, Qualcomm understands that a significant compromise with Apple will only bring its other customers to the door demanding the same treatment. It understands that 70% of its profits come from patent royalties, and that losing a modem customer is much less important than supporting its longstanding licensing program. It has a 20-year history of facing down legal challenges to its “all the patents you want for a standard price” policy, having held firm against the likes of Motorola, Broadcom, Nokia, Ericsson, Samsung and the entire Chinese industrial complex in suits and investigations brought across jurisdictions around the world. It has an all-star team of well-seasoned patent law experts who have seen all these arguments before. Essentially, Qualcomm has a very strong case and the motivation of an existential threat to its IPR business. They are not likely to blink in this chicken game.